Home to the greatest diversity of species in Africa in the legendary wildlife areas of Kruger National Park and surrounding private game reserves. Mpumalanga, is South Africa's most sought-after big game destination. 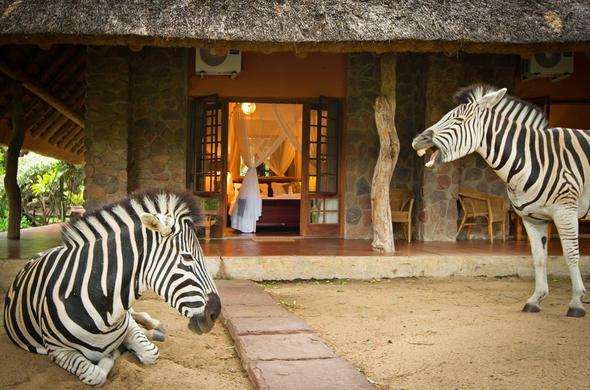 Mpumalanga is big game country and the safari lodges portray the era of the Africa of old in a range of styles. From rustic comfort to ultra luxury, the Mpumalanga safari lodges near Kruger National Park will provide something for first timers, as well as the discerning safari traveller. Embark on a trip to experience the breathtaking landscape of Mpumalanga Province in South Africa on a Hot Air balloon ride. There is no better way to discover the Lowveld with its variety of plains game or the thrilling expanses of the Blyde River Canyon than on these magical 'lighter than air' excursions. A professional organization of pilots and guides with knowledge of the landscape will ensure safe, informative and unforgettable adventures. Exchange a greeting of trunks with the Elephants of Kruger. With experienced guides and rangers lending a helpful hand, guests will enjoy awe-inspiring encounters with these compassionate giants. Activities include touching, feeding as well as rides on the world's largest land mammal. Combine wildlife with the spectacular scenery of the Panorama Route, thrilling adventure sports and the temptations of wellness spas and you can look forward to an unforgettable safari holiday, South African style.Highlights en route include the sleepy mining town of Pilgrim's Rest the cultural attraction of Hazyview and the quaint farming village of White River.A wide range of activities await you from game drives and Big Five safaris to exciting night drives, guided bush walks, dining under the South African sky and watching African wildlife from the comfort of your Mpumalanga safari lodge. See the spectacular Blyde River Canyon, the Three Rondavels and God's Window. Experience the culture of the Shangaan people in stories and visits to local villages. The Panorama Route is a pristine destination along the Mpumalanga Escarpment characterised by immense canyons, valleys, waterfalls and rock formations. It is home to some of the most scenic natural wonders and attractions in South Africa such as the Blyde River Canyon, God's Window, Bourkes Luck Potholes and the Lisbon and Berlin Falls.